The current social, economic and political situation allows for excessive exploitation of natural resources. There is an energy in our world right now that is frenetic, sobering, and has the potential for grave results. There is a necessity to push for peace, to challenge established views, and to dissolve misconceptions. 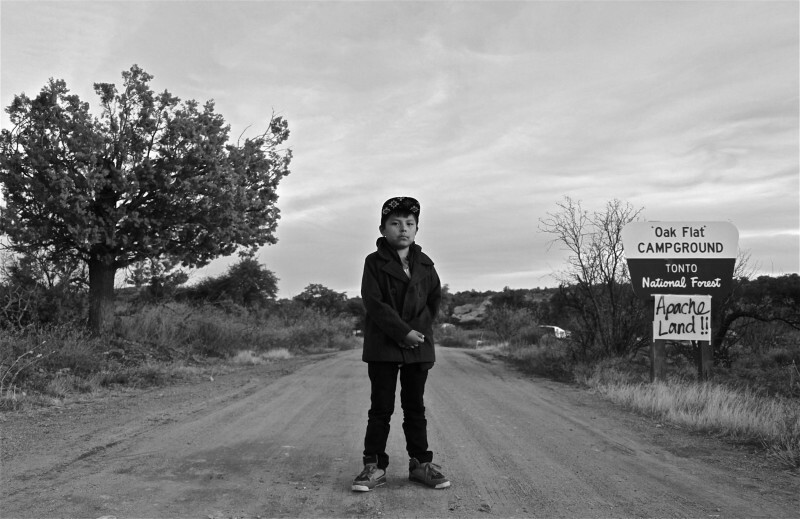 In the context of the #NODAPL movement that is protecting precious water sources that are being threatened by the Dakota access pipeline, this exhibition gives voice to the fight for the sacred land of Oak Flat, Arizona. Social Practice Queens, a partnership between Queens College CUNY and the Queens Museum, and the Apache Stronghold collaborate to bring this exhibition to the Queens Museum Community Partnership Gallery. The exhibition of photographic portraits by Standing Fox, Bedonkohe Apache photographer and artist, and landscape images by artists Floor Grootenhuis and Erin Turner, focus on Oak Flat, Arizona. This landscape, sacred to the San Carlos Apache, sits in the Tonto National Forest and has been protected land since 1955. A controversial land-swap presented in an unrelated 2015 National Defense Bill by John McCain, allows Resolution Copper (a joint venture by Rio Tinto and BHP Billiton) to develop a block-cave mine which is perceived to create a 2-mile wide crater. The Apache Stronghold is fighting to save their sacred ground. These artists document aspects of the landscape that are at-risk of being destroyed due to a copper mine moving into the area. These images first accompanied a conversation under the same title: Protecting Our Nature and Our Sacred Land that was held at the Queens Museum on January 29, 2017 at Mierle Laderman Ukeles’ Peace Table. Apache Stronghold member and former chairman of the San Carlos Apache Reservation, Mr. Wendsler Nosie Sr. led the Queens community in a conversation about sacred spaces, conservation, and Native American activism. This event was documented by Uno Nam. Floor Grootenhuis, Uno Nam and Erin Turner are part of Social Practice Queens (SPQ), and were collaborators in developing the Public Programs of Mierle Laderman Ukeles: Maintenance Art Peace Talks. This exhibition has been made possible with support from Social Practice Queens, Queens College CUNY, Queens Museum, the Apache Stronghold, and the Shelley & Donald Rubin Foundation.